First I want to take the time to thank you, Tutorialzine's readers, for all your support the past year and to wish you a happy new 2010! A lot of interesting tutorials are on their way and there are also some nice changes planned which I am sure you'll like. Now lets start the year with a brand new tut! I love your site! It's the best out there. I was wondering if you could create one day a tutorial on how to create a sleek event timeline like Google's 10th Birthday Timeline, available at http://www.google.com/tenthbirthday/. That would be much appreciated! I am sure many other people would be grateful for that tutorial too. I am always on the look for good tutorial ideas, so Vinnie sent his email right on time! First, be sure to grab the example files from the button above, so that you can easily follow what is going on. The first step of this tut is to create the XHTML structure, as seen in demo.php. I have omitted some of the PHP code that generates the events so we can take a better look at the markup (we will get back to it in the next step). Te main idea is that we have two divs - timelineLimiter and timelineScroll positioned inside it. The former takes the width of the screen, and the latter is expanded to fit all the event sections that are inserted inside it. This way only a part of the larger inner div is visible and the rest can be scrolled to the left and right by a jQuery slider we will be making in step 4. Now lets take a look at the PHP back-end. PHP selects all the events in the database and groups the events by year in the $dates array. It later loops through it and outputs all the events as <li> elements inside of unordered lists which belong to each of the event years. Thus the complete markup for the page is generated. Now we are ready to apply some styles. After we've inserted the CSS stylesheet to the head section of the document, we can start laying down the rules. Only the more interesting ones are included here. You can view the rest in styles.css. Here the .event class styles the event years sections (these are the divs that group events that have happened in the same year). Near the middle of the code you can see that we've used some CSS3 rounded corners which work in the majority of browsers (not supported by IE and Opera). We also define individual background images for each of the event types - image, news or milestone. I've split the code below in two parts so they are more comprehensible. As you may have noticed in the PHP section of the tut (if not check it out - around line 33) that with each event we include a set of div elements which contain additional information (title, text and date). Those are hidden with display:none in our CSS file, and are accessed by jQuery so that the pop-up window can be populated with data without the need of sending AJAX requests (not to mention that this content is visible to search engines and is great for SEO). So it is a win-win solution. In this function we are basically treating the parameter passed from Part 1 above, where the function is called, as regular HTML and use the standard jQuery selectors thus populating the title, date and body variables. This last step is only needed if you plan to run the demo on your own server, or like an addition to your current site. To make it all tick, you have to recreate the timeline MySQL table from timeline.sql, provided in the download archive. You will also need to fill in your database credentials in connect.php. With this our Event Timeline is complete! 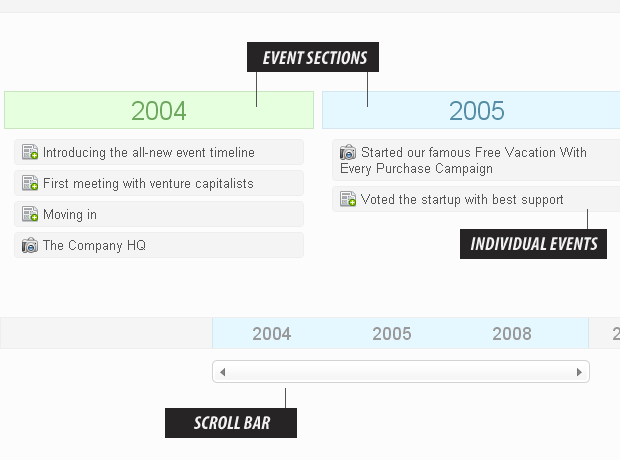 Today we created a timeline that you can modify to showcase the important events that mark your days. It is easily modifiable and you are free to use it in your or your clients' projects. Another great tutorial =] You really put a lot of work into your tutorials. Thanks for them! Very good tutorial. Maybe i will use your tutorial. really nice tutorial and work i love jquery and thanks to jquery and guys like you who are making developer's life easy. Nice tutorial with nice css. The timeline 'bar' seems to stretch so wide that you can't really scroll. Am I missing something? Awesom Tut! Just what I was looking for!! Thanks!! Thanks a lot! The design and the connection of all features are fantastic! I made it with CodeIgniter as a module (to add / edit / delete content) + a widget to show the whole event list. The only problem I see the widget should be in the top part of the page because the content is not over the list, but in the top part. So, I need scroll up if the widget in the bottom part. Google shows its content over the list. Very nicely done. Just one small enhancement I'd suggest: adding a close button to the pop-ups (or instructions to click outside it to close). That's The Great Tut! Thx so much!! Any Chance we will see a Word Press Plugin of this? Anyone planning on porting over? Unable to establish a DB connection. Got something to do this weekend!! THank You! Hi! Your featured slider is very cool! Will you write the tutorials about your featured slider? ^^ How to make it work with wordpress? :D! Thanks for all of your tutorials ! Nice Work. FYI: On the mac version of FF 3.0 it is not showing up. How about if we have lots of even (like 1000+)? How it gonna look like? I think that we can add ajax to load live shown data when user scroll to them. This is awesome. Great tut. We've been looking for a slick way to show our company history and just couldn't find anything that had that 'wow' factor. Wow, this website is a life saver as I use many of this website tutorial to help aid me to create my website. Now all I'm missing is a good flip image gallery effect. Anything after the 1900s show on my timeline but anything before it get Dec.31-1969. how to work with dates before 1969? The standard date and time functions in computers do not go before 1970 (it is considered the birth of the UNIX era). This way instead of using the limited date/time functions we just extract the last portion of the string. That's one of the most amazing use of jquery I evr seen. Wonderfull! Thanks for sharing. is there a way to have the slider to the right position by default? in the google time line, years can be split if there are too many events in one year, like 2004 January-March, 2004 April - June. Can I split years with your program. If not, are there other similar php programs that can draw a time line? Great tutorial!! The best tutorial I have ever seen! But can not work very well for IE6.0.Thanks very much! Nice and standardized - if it only had keyboard access - thanks for the demo! How may I get an a correct order? I am sorry, forget muy comment.. I get it., but changing the date just for years (without mounth and day). I will keeping tryng. The program result very good!!!!!!!!! Congratulations. The addition of $(window).scrollLeft() and $(window).scrollTop() will help keep the window centered during scrolling. But how to display the date in German? For example: 04.März 1989.
really nice tutorial and work i love jquery and thanks to jquery and guys like you who are making developer’s life easy. I have many events within a year and that causes the scrollbar is very down and out of place. I wonder if I can group the events by MONTH - YEAR. This tutorial is GREAT ! I will show it within some content (so, I don't have screenWidth for max. place, just 500 px. Is there a way to change the script therefore? I have problems with the aplication in the ipad, why the function scroll is not operative. Can you help me? I don´t know made the .js file for solution of this problem. I think this isn´t very dificult, but i don´t know. The problem is caused for overflow: hidden. This option is not operative in IPAD. For run this demo in IE 9 is necesary use the jquery 1.8.2 version. This version of jquery arrange problems with draggable bars. That answered my issue. Thanks for sharing.